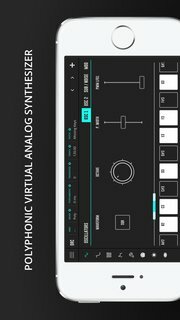 DRC is powerful virtual analog polyphonic synthesizer that recreates the characteristic sound of an analog synthesizer proving a minimal but powerful set of parameters, for limited but incredible sonic capabilities. With the cloud preset sync technology, DRC enables you to sync patches across devices effortlessly. With this powerful feature, you to start the creative process on one device and continue on another, seamlessly. "Elegant, easy to navigate and sounds brilliant." "I can't enough express how amazed and happy I am playing this app. Before to write this review I read the manual (you must) and tested every parameter until understand perfectly how every one respond to the final output sound. I have to tell you the presets do not show how powerful this synth can be, you have to tweak by yourself every filter, modifier and fx's. For me the filter is the secret in this app to get a differentiated sound compared to your other synth app's. Filter add a deep texture and resolution to the sound that I forgot lfo's and adsr's."" "One of the best iPad synthesizers!" "This sounds better than 99% of iOS synths. Filters are awesome. Modulation options are numerous. Effects are great. Sounds like a Mac plugin, not an iOS synth. Very little out there like this. I have paid hundreds on the Mac for this kind of sound." "A wonderful synth with it's own unique character to it." "This app is excellent! Just enough of a twist on the standard synth app to make it worth the investment. Patch creation seems to be the focus, and UI is perfect for flipping back and forth while working out new presets. Cloud support and coming VST integration makes this synth truly a promising venture." "Huge tone that will cut through any mix Fantastic control options for the musician Rich sounds and a beautiful visual design A developer who cares greatly about his customers and creation (frequent updates) It's alive! Recommended!" "Easy to lose yourself in sound design. The sound sources, fx, filters and modulations are all laid out to be very easily accessible. The mixer is great for tweaking the balance between the sound sources to fine tune your sound. Can tell some love went in to making this"
"Great, rich, full-sounding sounds! Great job!!!" "Awesome updates from a developer who truly cares about both their customers and their work. Nice job!" "It is FAT. The interface is intuitive. It is universal." "This is really a fine example of a synthesizer whose developers love synthesizers. It is rather difficult to explain, but there is something within not only the interface, but in the nature of the sounds that this thing produces that shows their passion. This synthesizer is a patch designer's tool, not a preset player. Yes, it does come with some nice patches which show off some of its abilities, but when you start to dig in yourself, you can create some really unusual sounds." "Excellent job guys. The GUI looks great and everything is extremely easy to access and in a logical way. The fact that you can upload your patch to the cloud and carry on working at home is a plus also." "Nice effects section great delay nice chord section IAA instrument support complete with transport bar and Midi learn. Good stuff."